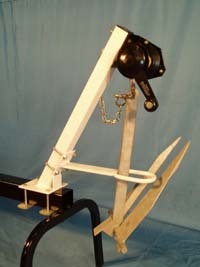 Boat Accessories | Pontoon Boat Anchor Davit | VE-VE Inc.
"Winch Stand & Davit" ONLY is white electrostatic coat finish. It easily mounts to pontoon deck for convenient storage of anchor when not in use. NOTE: Shown with Opptional winch (NO LONGER AVAILABLE!! ), rope and anchor Not included.